^ Trademark Status & Document Retrieval (TSDR). United States Patent and Trademark Office. [2014-01-19]. （原始内容存档于2012-02-05）. ^ 3.0 3.1 3.2 Bowes, Elana. Playtex, Gossard gird themselves for battle of bras. Advertising Age. 1993-10-11. ^ Wonderbra Canada Website. Hanesbrands Inc. 2007 [2014-01-19]. （原始内容存档于2013-12-10）. ^ See US 2245413 and Farrel-Beck, Jane. Uplift: The Bra in America. Philadelphia: University of Pennsylvania Press. 2001: 120. ISBN 0-8122-3643-2. ^ 6.0 6.1 6.2 Diagonal Slash Feature of Brassiere's Design. Style - for the Canadian Women's and Children's wear trade. 1964-06-20: 37. ^ Export Trade Grows. Style - for the Canadian Women's and Children's wear trade. 1964-06-20: 37. ^ Farrel-Beck, Jane. Uplift: The Bra in America. Philadelphia: University of Pennsylvania Press. 2001: 167. ISBN 0-8122-3643-2. ^ Hill, Daniel Delis. As Seen in Vogue: A Century of American Fashion in Advertising (Costume Society of America Series). Lubbock: Texas Tech University Press. 2005: 153. ISBN 0-89672-534-0. ^ 11.0 11.1 11.2 Mintzberg, Henry. Mintzberg on Management: Inside Our Strange World of Organizations. New York: Free Press. 1989. ISBN 0-02-921371-1. ^ Thomas, Sheila. 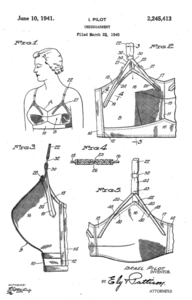 Nadler: leading 'corsettiere' (he makes bras). The Montreal Gazette. 1972-12-20. ^ Wilson, Robert. Sales are shapely. The Montreal Star. 1972-11-06. ^ 14.0 14.1 McClean, Clare. Unhooked! The two-sided yet uplifting history of the bra. Seattle Weekly. 2000 [2014-01-19]. （原始内容存档于2012-10-03）. ^ In an article written about her husband, Elaine Goldstein is given credit for coming up with the tagline. Arnold, Janice. Montreal Jewish lawyer named to the Senate. Canadian Jewish News. 2006 [2008-02-27]. （原始内容存档于2011-06-06）. ^ Gray, Alan D. Bra makers back from the brink. Financial Times of Canada. 1979-09-03. ^ Antweiler, Prof. Werner. Canadian Population Pyramid: 1980 (PDF). University of British Columbia. 2002 [2014-01-19]. （原始内容 (PDF)存档于2012-02-06）. ^ 24.0 24.1 Prager, Emily. Underwire Wars. New York Times Magazine. 1994-01-16. ^ O'Neil, Sinead. Hello again boys!. The Sun. 2004-05-10. ^ Drivers warned over lingerie ads. The British Broadcasting Corp. 2002-12-24 [2014-01-20]. （原始内容存档于2013-11-13）. ^ Gibson, Janine. Tory advert rated poster of the century. London: The Guardian Unlimited. 1999-10-16 [2014-01-20]. （原始内容存档于2013-11-03）. ^ Article in The Times, 19 June 1999, p.42, as quoted by Winship, Janice. Winning Women? in Steven Miles, Alison Anderson, Kevin Meethan (eds.) The Changing Consumer: Markets and Meanings. London: Routledge. 2003: 25. ISBN 0-415-27042-1. ^ Sara Lee sells European branded apparel business. The Business Journal of the Greater Triad Area. 2006-02-06 [2014-01-20]. （原始内容存档于2012-10-21）. ^ Sun Capital Partners Press Release. Sun Capital Partners. 2006-02-07 [2007-10-13]. （原始内容存档于2007-10-13）. ^ The Greatest Canadian Inventions. Canadian Broadcasting Corporation. 2007 [2007-02-24]. （原始内容存档于2007-02-17）. ^ Hart, Meghan. Wonderbra Hailed as Greatest Fashion Invention Ever. Papierdoll Magazine. 2008 [2014-01-20]. （原始内容存档于2012-06-29）. ^ WonderBra's 70th anniversary. Chatelaine. 2009-05-19 [2014-01-20]. （原始内容存档于2014-02-02）. ^ Wonderbra 70th anniversary. wonderbra.ca. Hanesbrands Inc. [2014-01-20]. （原始内容存档于2014-01-20）. Mintzberg, Henry. Tracking Strategies: Towards a General Theory. New York: Oxford University Press. 2007. ISBN 0-19-922850-7. 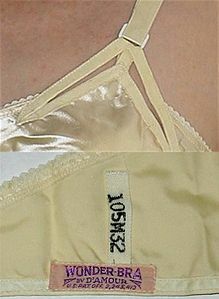 In this update to the Wonderbra story, Prof. Mintzberg directs readers to this Wikipedia article for further information.